The Toronto Beer Festival site was a great success; winning design awards and delivering an intuitive CMS for the staff to quickly manage the site. 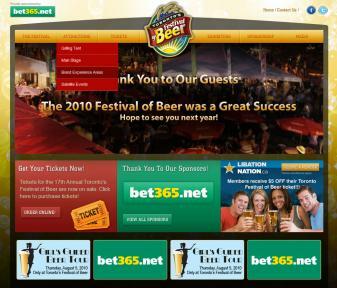 The Beer Festival has been the premiere summer time event in Toronto for over 20 years. The goal of the project was to convey the popularity, focus on beer, and growing number of stage acts and micro-events taking place at the Beer Festival each year. The design created, with it's bubbling beer background and iconic logo, reflects the festive mood that is the Toronto Beer Festival. In order to ensure the audience is updated, visitors can peruse the Blog, read the recent tweets, and connect with staff by registering for the newsletter. Having worked for the Festival of Beer for over three years, and having attended the Beer Festival each year, we can proudly say that it's a pleasure to be involved, and if you haven't visited, it's a must-go-to event. See you at the Festival of Beer this year? ALSBC re-launched their website with a slick design, strong message and simpler content management solution.